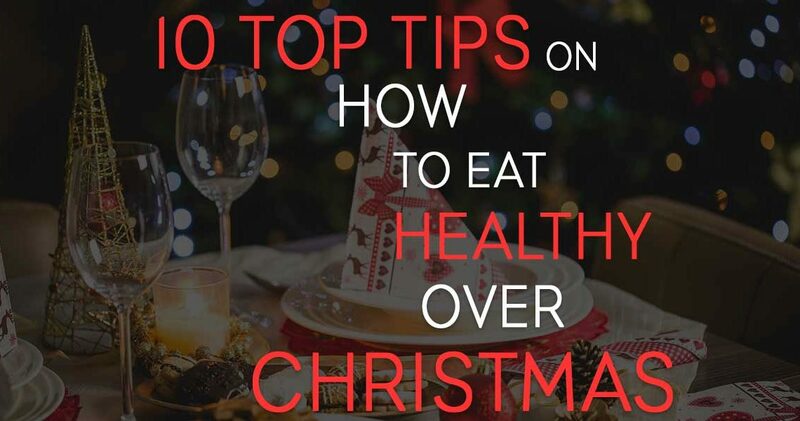 The Christmas challenge is set and I have given you my 12 top tips on how to stay healthy over Christmas but what about that all-important nutrition. Christmas is an indulgent and tempting time of year and healthy eating and nutrition can go out the window fairly fast, but only if you let it! I am here to tell you that it may be easier than you think to stay on top and eat well without doing any damage to your health or fitness goals over the Christmas period. All it takes is a little effort, plenty willpower and a whatever it takes attitude. One of the hardest elements to manage over the festive period is, temptation. Food is plentiful, filling and everywhere we look, and we have to face the reality that “out of sight out of mind” is not going to be the case over Christmas. When it comes to nutrition do not focus on restricting certain foods or trying not to give in to temptation (you will drive yourself mad). Instead, shift your focus on moderation and making healthier food choices where possible. When filling your plate or being served food, take a small portion, to begin with and then when you have completely finished it give your self a chance to let the food settle and then if you feel like you need more you can always go back for a smaller second helping. Keep portion sizes small and give your self-time to enjoy your choices. Don’t worry I am not going to recommend you premake all your meals and leave the house with a bag of healthy nutritious food on your back and expect you to eat out of Tupperware while everyone around you is enjoying their Christmas treats. 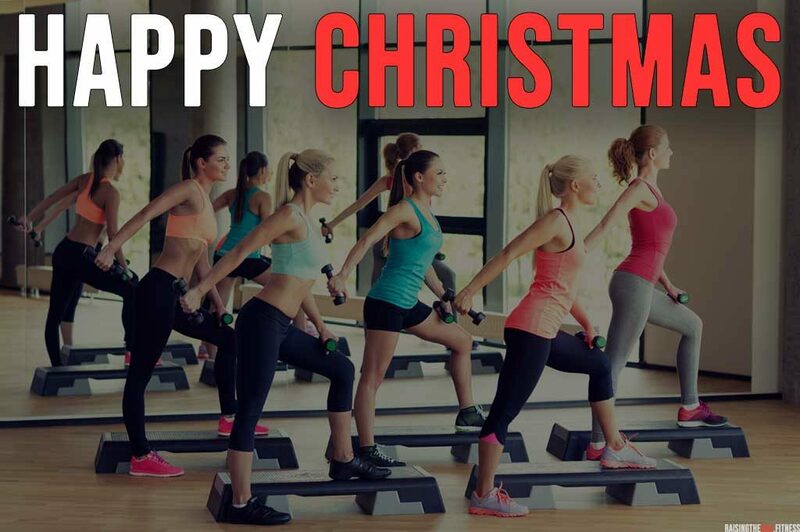 But there are small steps you can make in preparation to ensure you do not overdo it this Christmas. Bring a healthy filling drink with you – liquid calories are quick and easy and keep you full so you don’t give in to temptation. I am thinking along the green smoothie lines here. Mentally prepare to be tempted – Its Christmas you will be tempted so do not try and fight it just have a plan on how to manage it and enjoy your time its Christmas. I have already told you I am not going to recommend bringing the Tupperware dishes with you by this step I am referring to parties and get together’s. Christmas is the time of year to socialise and get together with friends and families, gatherings of all shapes and sizes are common and the host is usually out to treat their guests and so they should. As you have no way of knowing what food and drink will be on offer or even if there will be healthy choices if you want them, the best solution is to bring a plate of your own creation with healthy, nutritious foods/snacks and drinks. This way at least you know you have a healthy option when needed and after all, it is rude to turn up empty-handed. Leaving the house hungry anywhere in the build-up, up to Christmas and over the period itself can have detrimental results on our fitness and nutrition plans. We all know that having to eat on the go nearly always ends up with convince eating and at Christmas, the conveniences are rich, heavy and what they lack in nutrition they make for in sugar. If you leave the house on an empty stomach the chances are you are going to give in to every food temptation you come across and due to the lack of energy, your body is going to crave food types that can give it a quick hit namely sugar, stimulants and high GI carbs. Energy – Not eating breakfast can leave you feeling lethargic and lacking in energy which as mentioned before will leave you craving foods which will give you a quick fix but also lead to another quick slump, cause insulin spikes and leave in you in a reactive state for the day. Do not leave the house on an empty stomach. Having goals is one of the best ways to prepare, have a plan and have a reason to try and be as nutritious as possible. Over holidays and especially over the Christmas period I like to flip the script and I actually make nutritious goals to include the type of foods that tempt me the most. If a food source is tempting to you its because you like it and by trying to avoid it you are just fighting yourself. You can treat yourself and still get the benefits you are looking for as long as your consumption as a whole is balanced and nutritious. Example of a nutrition goal allowing for a treat – (temptation – mice pie) Today I am going to have no more than two mince pies over the course of the day. Make goals that work for you and your circumstances. Don’t try and fight yourself but remember as a whole you need to create mini nutrition goals that are still in keeping with your main ongoing fitness and nutrition goals. Yes, this was a tip in the How To Stay Fit And Healthy This Christmas post. And it is a tip in this post, and for any fitness, nutrition, concentration, wellness and health posts and tips 9 times out of 10 water and staying is included. This will show you how vital water intake is for our systems. For the purpose of this post we are looking at water consumption as a way to not only stay hydrated over Christmas which is vital at this time of the year but also as an appetite suppressant. That’s right water can suppress your appetite and can help you form giving in to temptation. Drinking water before and during a meal will help you to eat just that little bit less as it fills up your stomach with a substance that is not only vital but contains no calories. By ensuring you always have a bottle at hand and drinking it instead of Christmas coffees and teas, when you feel hungry when you feel tempted and before and during a meal you will not only eat less but also helps you feel energised and helps maintain a healthy body balance. Strategic nutrition substitutions can make all the difference and can have a dramatic effect on the number of calories consumed. I have already mentioned the benefits of carrying water with you and by drinking water, as opposed to Christmas drinks is the number 1 substitution you can make. 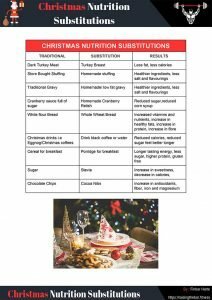 At the end of this post, I have included a Christmas substitution table to give you some quick substitutions to help you to eat healthy this Christmas. Grazing what I mean by grazing is staying by a food or liquid source and continuously picking, eating and drinking. Image a Christmas party 20 guests 3 tables laid out with all the Christmas snacks drinks and nibbles you can imagine you find a perch next to the table to get situated but by doing so you have a constant temptation source and nervous filler right next to you. The end result is picking and grazing which you can easily justify in your head as the snacks are small and your only having one at a time but the accumulative damage can be large not to mention the fact that all these little snacks are more calorific then you can imagine. If you know you are going to be in this situation in advance, be prepared, bring your own healthy snacks and ensure you are not walking in hungry. If you find yourself in this situation, don’t graze. Keep away from the table as much as possible, go up fill a plate (keeping portions small) and move away. Be conscious of grazing and if you find yourself snacking just be aware of it and stop as soon as you can. Another tip from How To Stay Fit And Healthy This Christmas post that also applies to Christmas nutrition. Where possible you want to try and start a meal with vegetable soup or a salad. Starting your meal with vegetable soup or a large leafy salad helps in two ways you are filling yourself up with high fiber water-rich foods which will prevent from overdoing it later on. You are also getting in those well-needed vitamins and minerals. Although vegetables are usually plentiful at Christmas, fruits seem to take a back shelf to chocolates and sugary snacks. Reintroduce fruit into your diet over Christmas and have it after the main meal instead of a desert. Fruit is giving you a natural sugar source that is high in fibre, providing additional vitamins and minerals and filling you up to help subdue later cravings that may arise. This is the number one tip in any circumstance or situation to ensure that your nutrition is on point and you will achieve your goals. No matter what you eat if you can stick to this method you will get the results you want. Please find attached my free quick Christmas healthy food substitutes. Subscribe for your free "HIIT Workout"
DO YOU HAVE A POST SUGGESTION? Raising The Bar Fitness blog. Providing you with easy to follow, EVERYDAY fitness, mindset and nutrition advice for EVERYDAY people serious about changing their bodies.